Crytek head Cevat Yerli has come out in defense of his studio's latest game, Crysis 3. In an interview with Gamasutra, Yerli says that the game is "so far, our masterpiece," and that he feels it's better than both Crysis 2 and the original Crysis in all aspects. He blames the game's tepid reception on the fact that gamers have fatigue with this console generation and with sequels, and says that because the first Crysis was such a different sort of game for its time, it had a bigger impact, which has caused gamers to remember it more fondly than it deserves. While I agree that history has warped our view of the first Crysis a bit—it's a fun but uneven game with some glaring flaws—for the most part I just don't agree with Yerli's assessment. I found Crysis 3 to be mediocre in almost every way, a short, unfocused, un-engaging game that fell short of both of its predecessors. Crysis 2 was a well-constructed quasi-linear shooter that made up for its personality deficit with enjoyable, balanced combat and polished production. 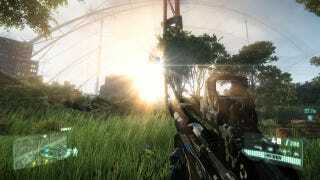 Crysis 1, while uneven, at its best was yards beyond either Crysis 2 or 3. Though I do agree that the first Crysis had a lot of problems that are easy to ignore in favor of focusing on those great opening chapters. Yerli goes on to say that while Crysis 3 had triple the budget of its predecessors, the only way it could secure that budget was by going multi-platform. But developing for the Xbox 360 and PS3 along with PC held them back. That must be frustrating. Visually, the PC version of Crysis 3 is miles beyond the console versions, but the core of the game—the size of the levels, number of enemies, and basic design and artificial intelligence—remains the same. While a PC-only version of the game may indeed have been cost-prohibitive, it's not hard to imagine what Yerli and his team could have done had they been able to make Crysis 3 for the PS4 and the next Xbox, rather than the current generation of consoles. As it stands, the game is still technically impressive in a lot of ways, but it'll likely be remembered as an end-of-generation footnote as we make the leap to new, more powerful consoles. Timing is everything, I guess. Go read the full interview at Gamasutra.